Coca-Cola Dr Pepper-Bottling CO is a refreshment center. The company is associated in bottling and distributing thirst-quenching and ice-cold beverages that consumers crave for throughout the world. They are highly renowned to offer drinks with classic Coca-Cola flavor. 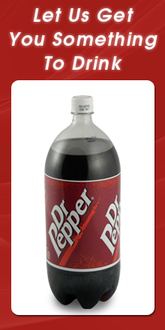 23 flavors of Dr. Pepper are well-known across all the states. Approximately 330 employees are associated with the company with various services including warehousing, equipment, delivery and production. The company started full-fledged operations in 1905. Their products cover a wide range of thirst-quenching drinks like Coca-Cola, Barq's, Dr Pepper, Canada Dry, Barq's, Evian, Dasani, Fanta, Full Throttle, Fresca, Gold Peak Tea, Fuze and others. There are currently 0 consumer reviews about Coca-Cola Dr Pepper-Bottling CO available. Share your review. Please take a note that you are about to post a public review about Coca-Cola Dr Pepper-Bottling CO corporate office on CorporateOffice.com. This review will be public, so please do not post any of your personal information on this website. If you would like to contact the corporate offices of Coca-Cola Dr Pepper-Bottling CO, please use their contact information such as their phone number, website, and address listed above to contact them. However, sometimes staff from Coca-Cola Dr Pepper-Bottling CO headquarters do read the reviews on this website.